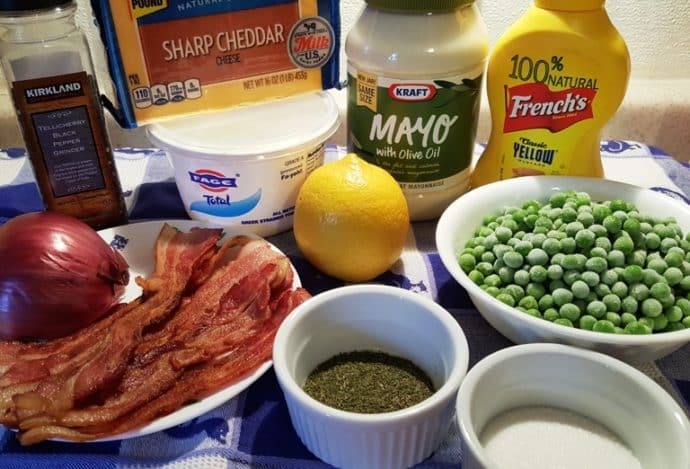 Claim Jumper Green Pea Salad is a copycat recipe which contains crispy bacon, sharp cheddar cheese and homemade dressing. 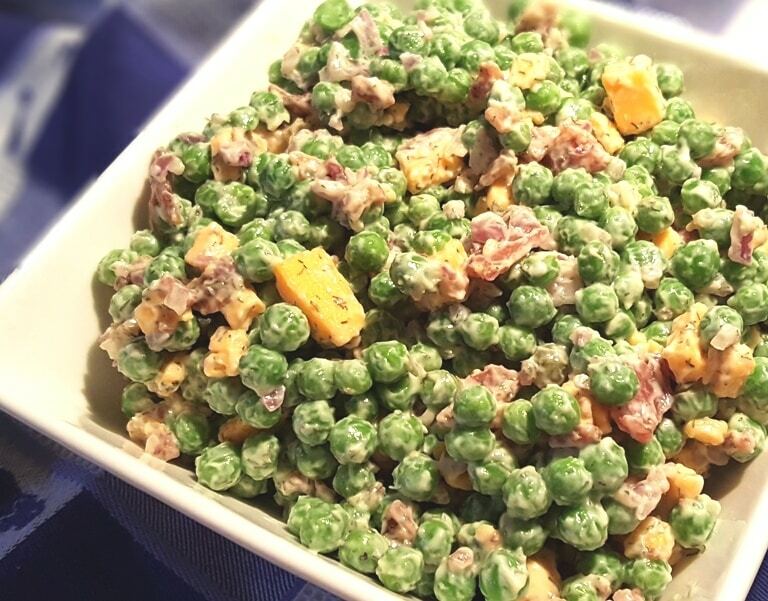 This copycat Claim Jumper Green Pea Salad is a cool and refreshing salad that is similar to The Claim Jumper Restaurant in LA. 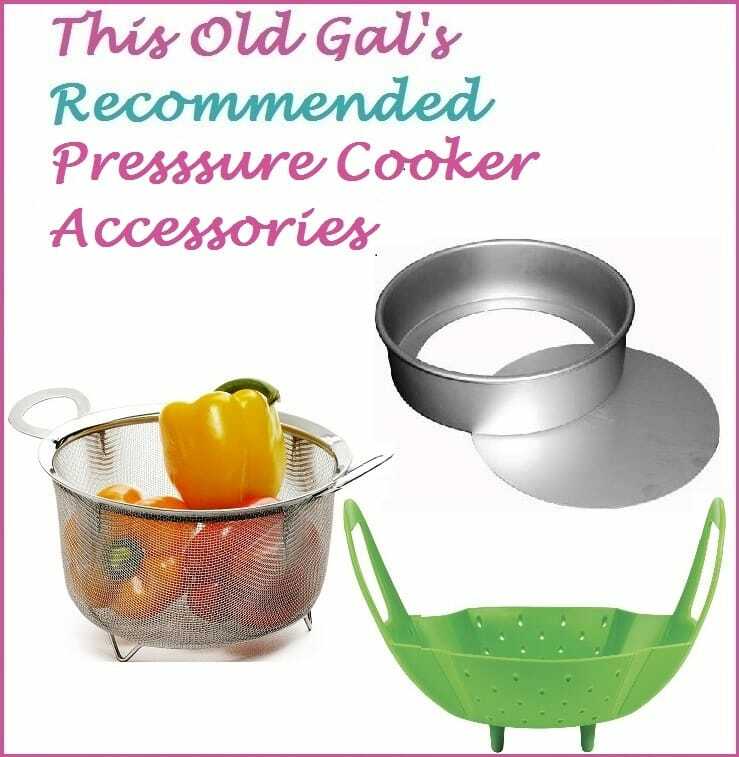 I have always loved salad bars and I have a neat system for piling on all the veggies, crunchies and sides. This sill way ensures that the salad is already mixed together by the time I get back to the table. Layering, that’s the trick. First, a thin layer of lettuce (don’t pile it on, you won’t have much room for all the goodies), then some veggies, dressing, eggs, seeds and beets. 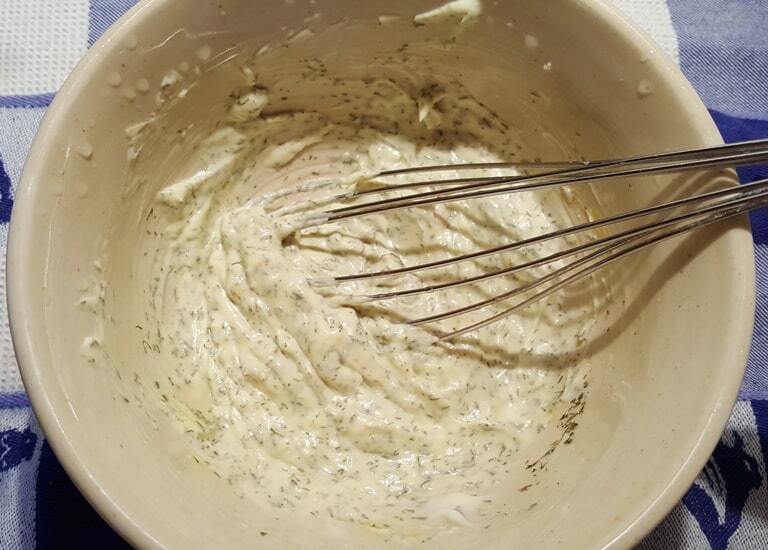 Round two, do it again and end with dressing and a sprinkling of sunflower seeds. I take my Salad Bar preparation very seriously. Next comes a few spoonful’s of the various mixed salads found at the end of the Salad Bar. 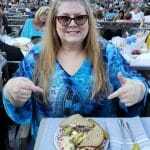 The Claim Jumper Green Pea Salad is always the first to hit my plate. Then, I get a little brave and try a few others and then back to my table. My husband gives me the evil eye and says, again, really? You know you never those other salads and you are just wasting food. Yeah, but I gotta try!!! If I could eat salad bar every day, along with this Claim Jumper Green Pea Salad, I would. 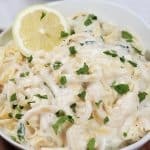 If you want to really make a meal out of this, try my Pasta, Cheese and Peas Summer Salad. First thing, fry up some bacon or chop up some ham. Vegetarians, add chopped up Smoked Almonds instead of the meat and you will have a wonderful Vegetarian Pea Salad. 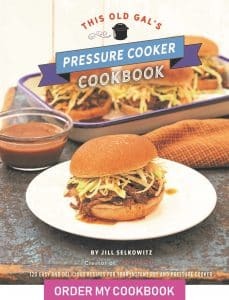 Pull out the center of the onion and get rid of it. It can tend to be a bit bitter. 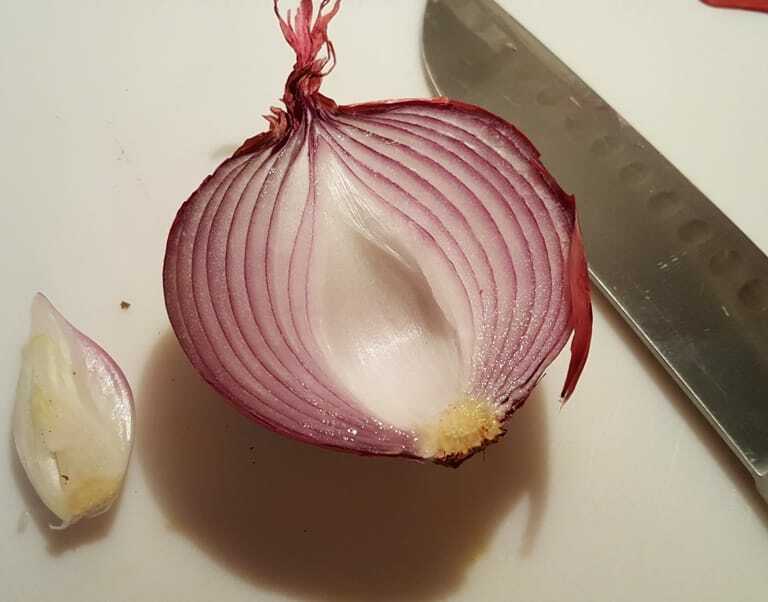 Dice up the onion as small as you can, unless you want big and crunchy onions. 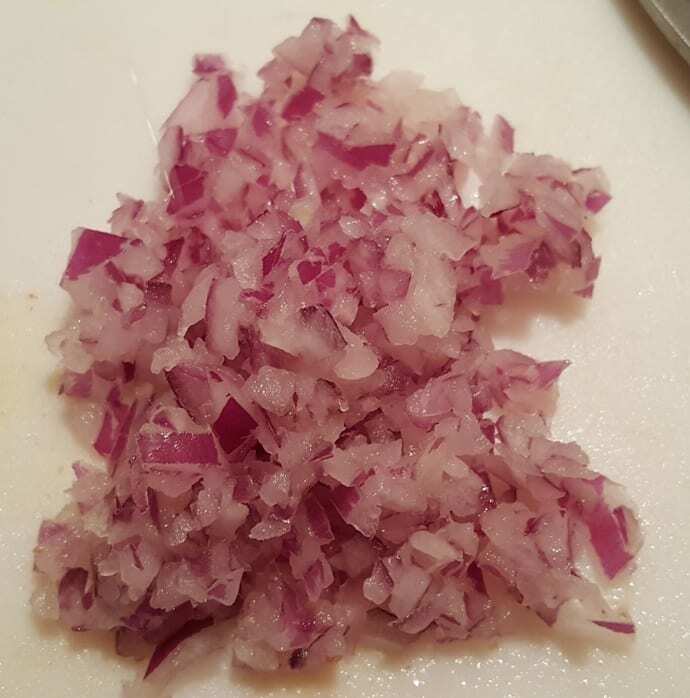 I like the onions small, so I use my Chef Pro Mini Food Chopper. 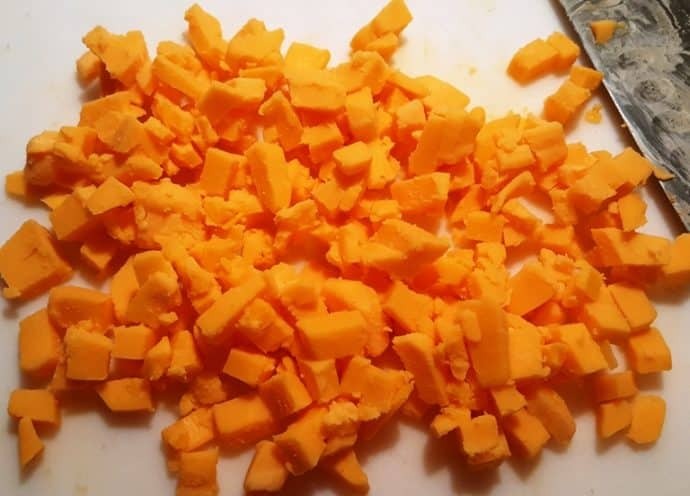 Chop up the cheese into tiny cubes. 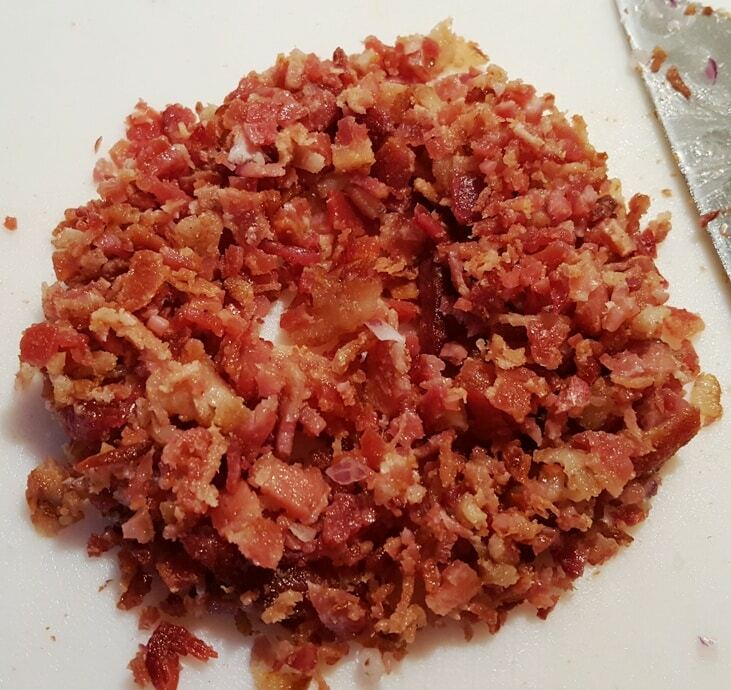 Crumble up the bacon and toss all of that into a large bowl. 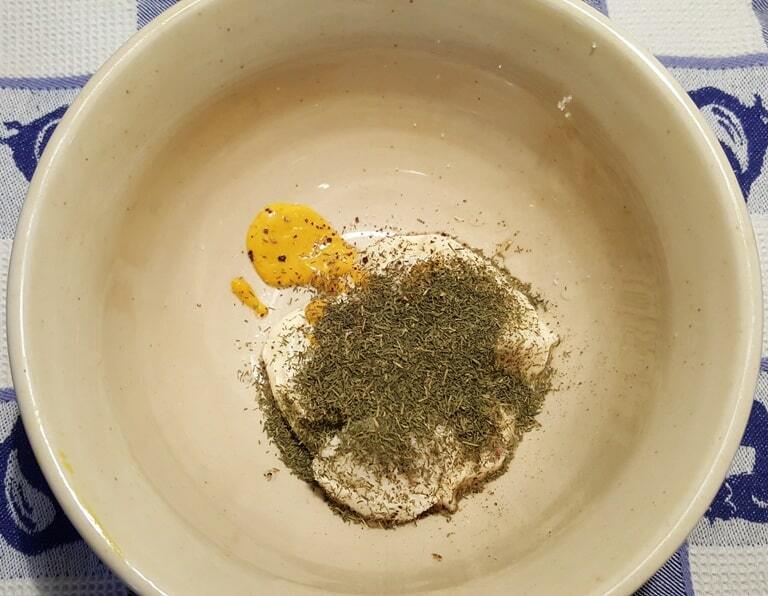 In a smaller bowl, add the dressing ingredients. Whisk the dressing together well. If you want a more saturated Pea Salad, add more dressing ingredients. 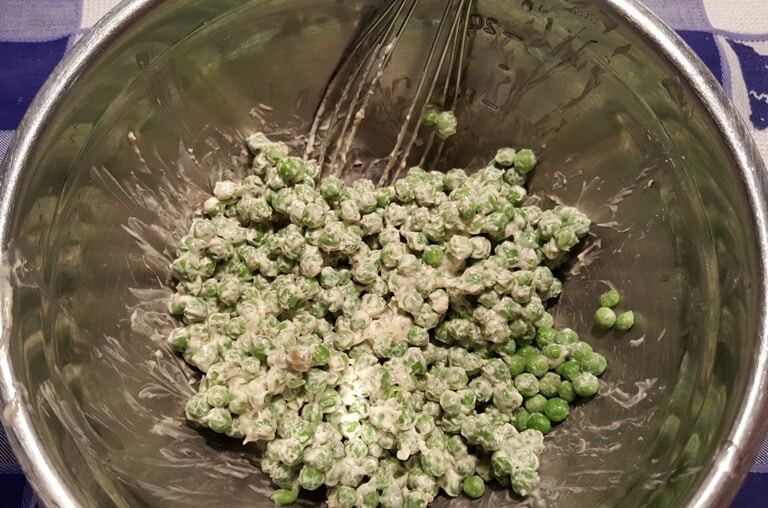 Claim Jumper Green Pea Salad uses a heavier coating of the dressing. 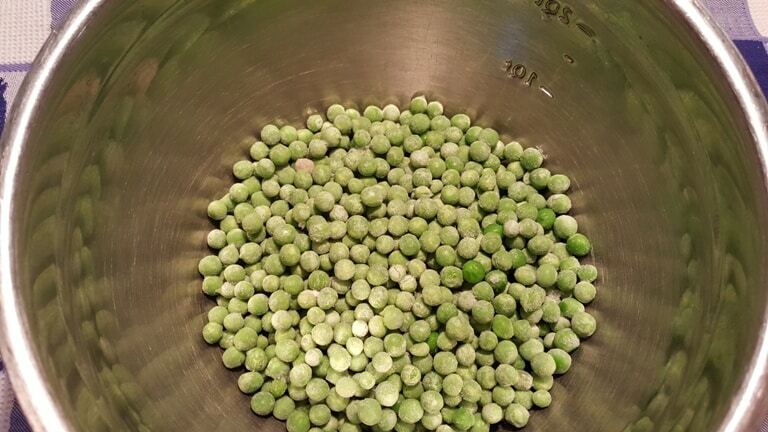 In a larger bowl, add your defrosted peas. Don’t use canned. They’ll be mushy and not crisp and crunchy like fresh or frozen peas. 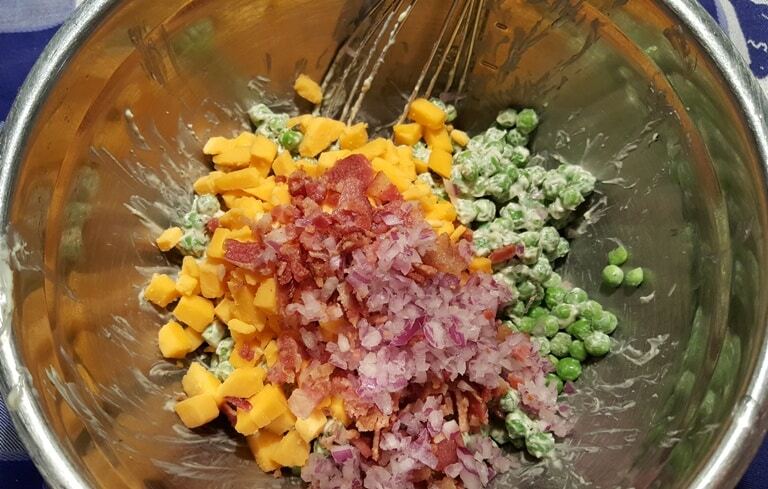 Add in the dressing and Whisk it all up into the peas. Toss in the cheese, bacon and onion and gently mix it all together. That’s it! Your very own, Claim Jumper Green Pea Salad. Pea salads are very popular at Pot Lucks and gatherings, so make sure you bring enough for everyone. I could eat the whole bowl as a meal. If you like pasta, check out my Pasta, Cheese and Peas Summertime Salad. 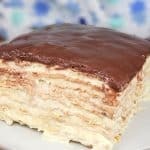 More Side Salad Recipes You Will Love. 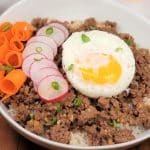 Mix everything together and let chill in the refrigerator at least four hours or overnight. 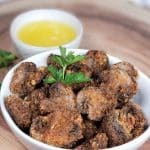 Vegetarians, use Chopped Smoked Almonds instead of meat. 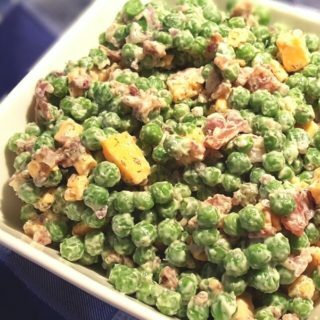 PIN this Claim Jumper Green Pea Salad! Love your blog! My hubs is allergic to mustard. 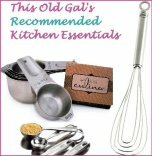 Do you know of a good substitute in this recipe and all recipes when it calls for mustard? Appreciate any insight you might have.